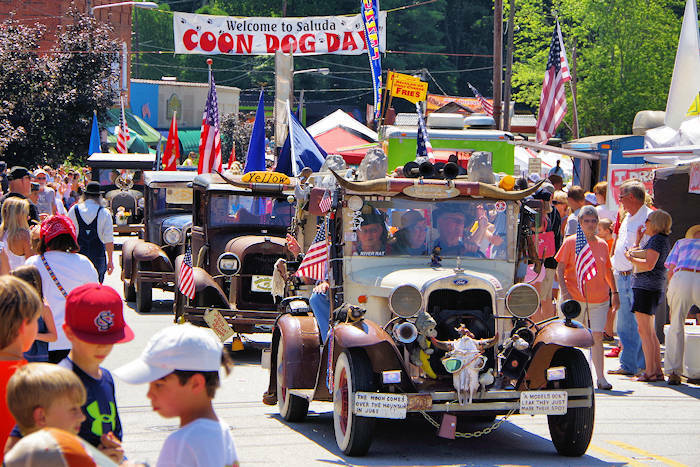 Asheville is vying for yet another title, Dog City USA. We are lucky to have so many hotels, restaurants and breweries that love dogs - a long history of being very pet-friendly. Now there's even a Dog Welcome Center! Here are some of our favorite spots to visit in downtown Asheville within a few blocks of each other. Pic above: The chef at the Twisted Laurel putting final touches on Sebastian's salmon entree. 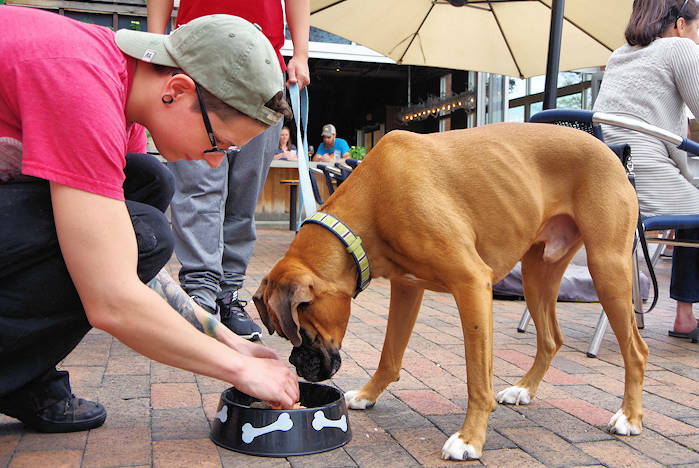 The Twisted Laurel restaurant downtown (130 College Street) even has a special menu for dogs bringing their owners to lunch and dinner on their outdoor patio by Pack Square Park! Features include the Twisted Doggy Bowl for $10 with a choice of protein (salmon, chicken, burger, scrambled eggs), starch (rice, sweet potatoes, roasted potatoes or orzo) and side (broccoli, carrots, zucchini or asparagus). Snacks ($4) include celery Sticks with peanut butter, orange slices and salad with yogurt. 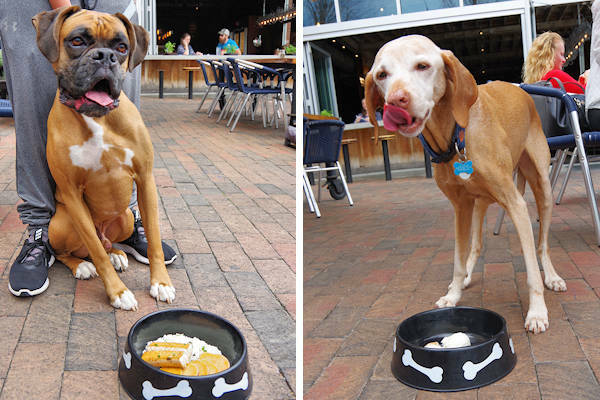 And don't forget dessert: doggy ice cream ($4/scoop), housemade doggy biscuits ($4), and frozen yogurt coated in peanut butter with a fruit center ($5). Pic above: Sebastian (left) and Lucy (right). You'll find many hotels that love their four legged guests (see our Pet Friendly Guide for a complete list). 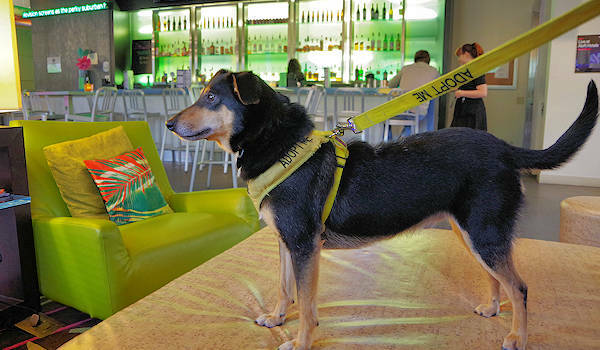 The Aloft Hotel in downtown Asheville includes a pet bed, doggie goody bag and even a rooftop dog walk. What really makes them different is their partnership with Charlie's Angels Animal Rescue to foster dogs looking for a home - and they have matched 80+ up with owners. They host one dog at a time - stop by and look for the "Adopt Me" vest. 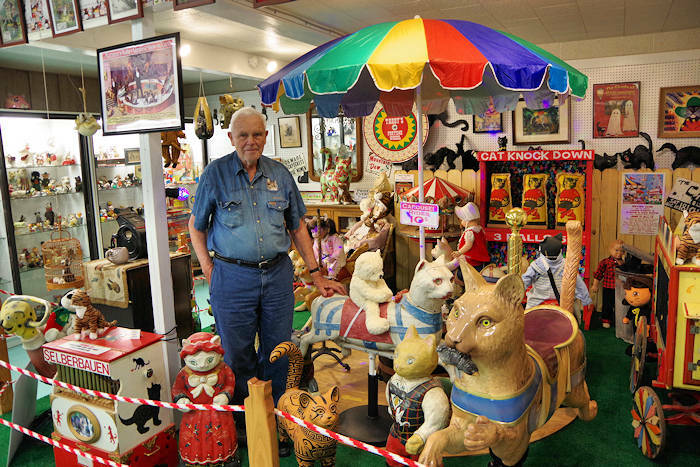 Stop by the first official Dog Welcome Center in the United States! Find indoor and outdoor seating, doggy potty area, water fountains, free goody bags, doggie ice cream, and info on their Top 100 dog-friendly attractions, restaurants, and things to do. 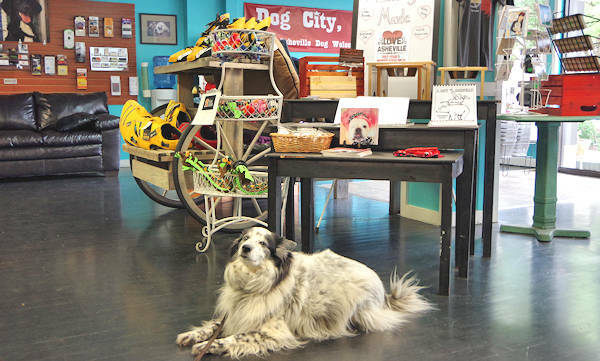 It's located inside the The Dog Door Behavior Center and Store, with treats, toys, chews, and necessities. They are downtown Asheville across the street from the Grove Arcade at 1 Battle Square. The Dog Welcome Center is open Monday-Wednesday 9-5, Thursday-Saturday 9-7 and Sunday 11-5. 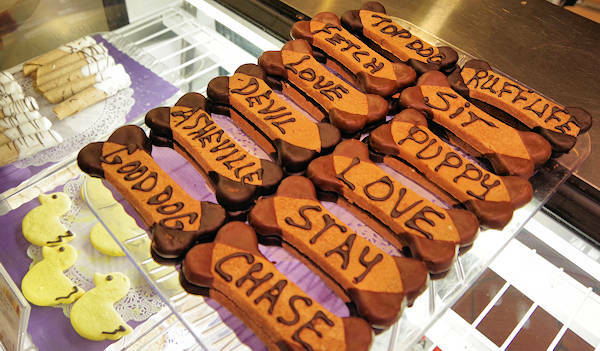 Stop by for some "pawsitively scrumptious" freshly baked all-natural treats, cakes, party trays, biscuits and more! Located at 21 Battery Park in downtown Asheville, they also have accessories. Owner Dr Beth Jones is also an expert in animal acupuncture that relieves pain and helps with mobility issues. See our Pet Friendly Asheville Guide for more places to stay and go - including hiking trails! Plus, read more about Downtown Asheville.